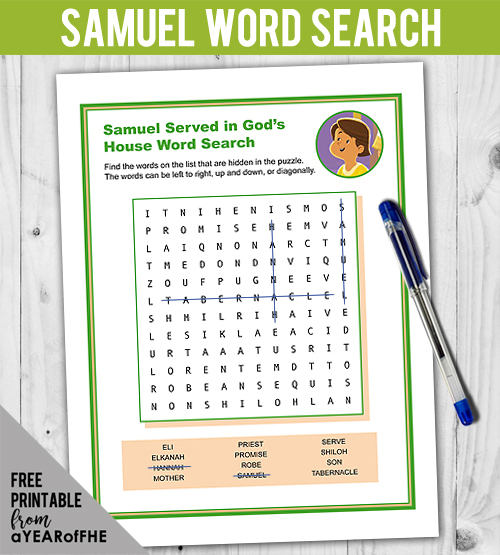 What You'll Need: scriptures, GAB 18/GAK 111: Boy Samuel Called by the Lord, printed activity pages, and coloring tools/writing utensils. Scripture: Deut. 28:1–2 - And it shall come to pass, if thou shalt hearken diligently unto the voice of the Lord thy God, to observe and to do all his commandments which I command thee this day, that the Lord thy God will set thee on high above all nations of the earth: And all these blessings shall come on thee, and overtake thee, if thou shalt hearken unto the voice of the Lord thy God. In the bible we read the story of a woman named Hannah. Hannah had wanted a baby for a long time. One day while she was in the temple she prayed, “O Lord, if you will give me a son, then I will give him to the Lord all the days of his life.” The Lord answered Hannah’s prayer and she had a baby boy. She named the baby Samuel. When the little boy was old enough to help in the temple, Hannah and Elkanah, his father, took him to the temple to live with Eli, the priest. They took him there to fulfill Hannah's promise to have her son serve the Lord. One night after Samuel had gone to bed, Samuel heard someone calling his name, “Samuel.” Samuel thought it must be Eli calling to him. He went into Eli's room and answered, “Here am I”. But Eli said he had not called and sent him back to bed. Samuel went back to bed, but after he laid down her heard a voice again calling his name...“Samuel,” and once more Samuel answered, “Here am I”. The boy ran to Eli, who answered, “I called not, my son,” and sent him back as before. The third time this happened, Eli realized that the Lord had been calling Samuel. He told the boy to go back to bed and, if the voice called again, to say, “Speak, Lord; for thy servant heareth”. When the Lord called, “Samuel, Samuel” again, the boy answered as Eli had told him. Then the Lord talked to Samuel and Samuel listened to His words. 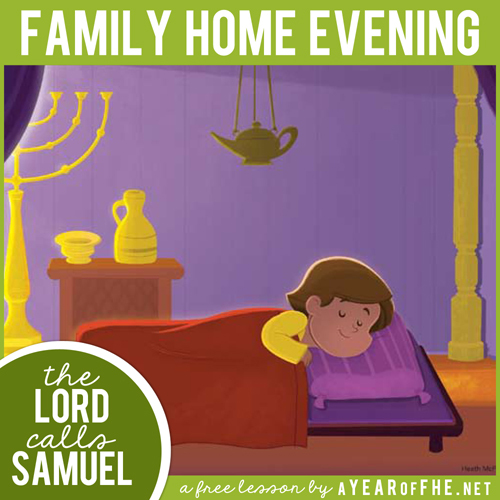 As Samuel grew up, he learned well the duties and responsibilities of being called by the Lord. Because Samuel listened and obeyed, the Lord was with Samuel as he grew, and all the people knew he was a prophet. Many times the Lord calls us and asks us to serve him. 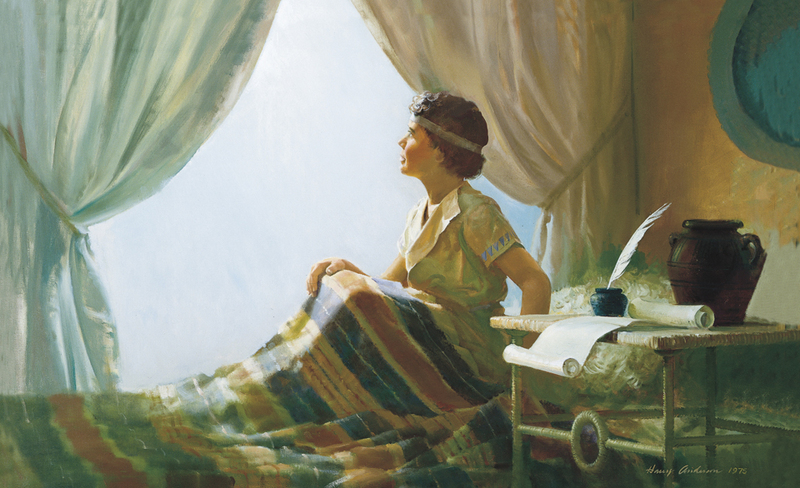 Sometimes it is through a mission call and sometimes it is through accepting a calling at church and doing our best. Sometimes the work we do for the Lord is easy and other times we may find it difficult. But if we always hear and answer when the Lord calls we will be blessed. We may also get a quiet prompting in our hearts to serve another of God's children. We may also be called upon to bear our testimony or to stand up for what is right. There is a primary song called if "I Listen With my Heart". Do you know it? The 2nd and 3rd verse of this song tell us about hearing the voice of the Lord, just as Samuel did. No matter what the Lord calls you to do or how he speaks to you, we will always be blessed if we answer His call. Bear your testimony about the blessing that come from bending your will to the Lords and serving in the capacities in which you are called. 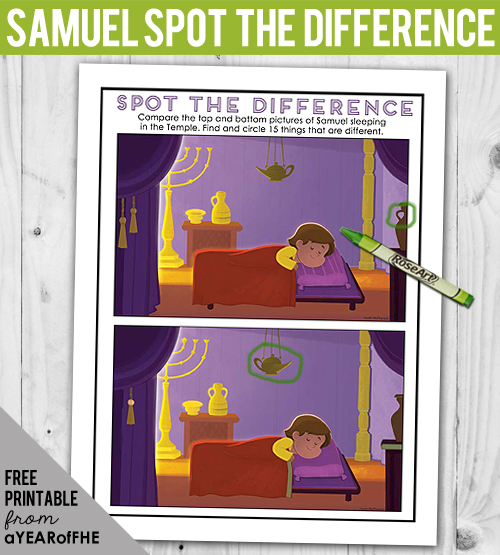 Share a specific time when you received a calling from the Lord and answered that call - share the insights and blessings you received as a result..
FOR YOUNG CHILDREN // SAMUEL "SPOT THE DIFFERENCE"
Thanks for making it so easy for me to teach my family....great lessons!! Thank you for the lesson! I'm sure you are so busy and I really appreciate the time you put into these lessons. It makes it so easy for me! My children and I love the simplicity of your lessons! Thank you!! I just stumbled upon your blog through pinterest. We are not very consistent with FHE, BUT we setting a new goal to do it every week. I think this will really help us stay on track and have a topic ahead of time. Thank you for taking the time to share your lessons for others to make FHE a reality! I got everything prepared for tonight and it looks great Thank you I.... We really appreciated it!! This is awesome! Thank you so much for all the work you do...I really struggle with good lessons that are simple enough for my kids to understand! Thank you! Another great lesson. THANK YOU!! Thank you so much for your lessons. I wouldn't be able to do FHE as consistently if you didn't do this. Thank you again!!! Noah gave us this lesson tonight. They loved that it's about a young boy serving God. Nice work, dude. 2013 is my year to make more of an effort for FHE. With your free lesson plans, you've taken practically all the effort out of it! Thanks for sharing! !